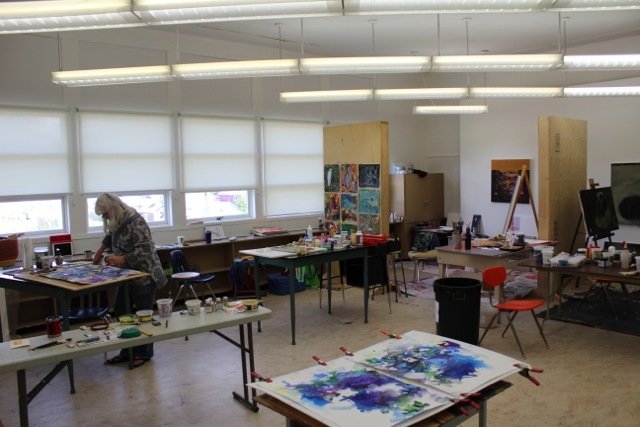 The Toni Onley Artists' Project for Professional and Emerging Visual Artists, July 9 - 17, 2016 in Wells, BC is an intensive studio experience under the mentorship of exemplary artists. IMA is very pleased to welcome Jeffrey Spalding, well known across the country for his work as a curator, artist and teacher to mentor alongside painter, Anong Migwans Beam. Funded in part by the BC Arts Council, IMA offers scholarship and bursaries to make this program accessible to everyone who qualifies. "The powerful learning and exploration that I experienced at the Toni Onley Artists’ Project is still paying dividends to the work that I create in my studio. 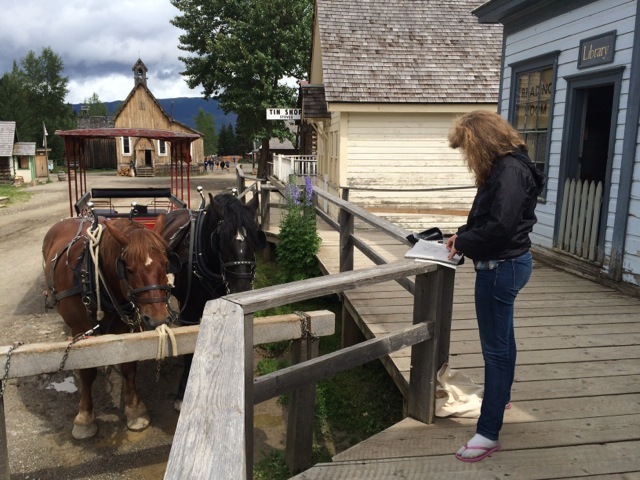 The nine days of intensive art making in Wells, BC provided me with this opportunity. Working and sharing in the intimate studio settings with other artists was inspiring. Twenty four hour access to the studio, pertinent lectures and impromptu meetings were essential to the intensive learning experience that I would recommend to all up coming and professional artists." Jeffrey Spalding C.M., RCA is a Canadian painter, multi-media artist, writer, curator, teacher and museum director, whose artistic practice has contributed to the evolution in Canada of video art, conceptual art and abstract painting, as well as the resurgence of romantic landscape painting. Spalding immigrated to Canada as a child. He obtained his B.A. in Fine Arts from the University of Guelph (1973), his M.A. in Art Education from Ohio State University (1975) and his M.F.A. from the Nova Scotia College of Art and Design (1976). A member of the Order of Canada, he has taught studio art, art history and museum studies at numerous universities, in Canada, the U.S. and Japan. Among his many administrative and curatorial positions, he has served as Director of the Glenbow Museum, University of Lethbridge Art Gallery, Art Gallery of Nova Scotia, and is currently the curator at the Beaverbrook Art Gallery in Fredericton, NB and Consulting Editor at Galleries West. Anong Migwans Beam is an artist living and working in M’chigeeng First Nation, Manitoulin Island. The daughter of Carl and Ann Beam, Anong has been touched by a powerfully creative family lineage, but carves out distinct artistic territory uniquely her own. Her works are hybrids of representational landscapes, and photographic records of memories, working primarily in oil on canvas, and different iterations of the monotype process. She studied at the School of the Museum of Fine Arts in Boston (1998), Ontario College of Art and Design (2000) and the Institute of American Indian Arts in Sante Fe, New Mexico (2001). Her work is in the permanent collections of the Beaverbrook Art Gallery, New Brunswick, Ford Foundation, New York, NY, Art Gallery of Sudbury, Art Gallery of Nova Scotia, Halifax, NS, Museum of Contemporary Native Arts, Santa Fe, NM, Ojibwe Cultural Foundation, M'Chigeeng, ON, Canadian Clay and Glass Gallery, Waterloo, ON and the Royal Ontario Museum, Toronto, ON. She has done residencies at the International Oil Painting Monoprint residency Hvar/St Clements Island, Croatia (2015), International Oil Painting Monoprint residency Zhangjiajie, HunanProvince, China (2012 & 2014) and MMMArt, Medana, Slovenia (2011). Anong has participated in many group shows and has had solo exhibitions at Station Gallery, Whitby, ON (2016), Latcham Gallery, Stouffvile, ON (2014), Art Gallery of Sudbury, Sudbury, ON (2012), and Gary Farmer Gallery of Contemporary Art, Santa Fe,NM. Newer PostSongwriting Contest Winner Announced!